When I first started reading Cold Fury, I had a hard time latching onto the story and getting into it because it had a slow start. But after one-hundred pages or so, the plot picked up considerably and I was hooked! There ended up being a lot of action and fighting, as well as endless secrets about the main character's family being uncovered, and there are a lot of funny and interesting characters to meet along the way. Sara Jane Rispoli is the main character, and she comes home one day to find her house in disarray and her family missing. This event is the beginning of something huge, and soon Sara Jane begins to piece together shocking information that involves her and her family, and this is when she learns that the Rispoli's have ties to the mob. She's had suspicions for a while that maybe there was more to her family than she was being let in on, and boy does she learn more than she bargains for when she gains access to an old notebook that holds HUGE secrets and information about "the Outfit" and her family's role in it. Sara Jane has to rely solely on her own intuition, playing detective and trusting no one as she jumps from hideout to hideout on her mission to find information about her family's whereabouts. With a crazy masked man (who is massively creepy!) popping up everywhere trying to kill her, she definitely doesn't have it easy. I really like Sara Jane, she's a very skilled boxer and she knows how to give it as well as take it. I never grew tired of her dishing out her justice. What I find most fascinating about her though is her "cold fury", which we get an example of several times in this book, believe me! I won't give anything away, but just know that this is a very surprising and interesting element in the story. The conclusion of this book leaves you wanting more and poses more questions. There's a lot of mystery within the entire plot and it definitely doesn't cease at the end of the book. 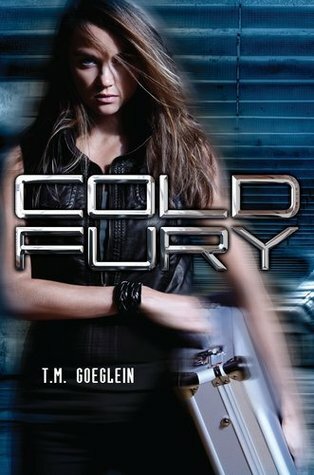 I recommend Cold Fury to anyone looking for a story rich with betrayal, secrets, action, the mob, and a strong female protagonist. I'm certainly interested in continuing on this journey with Sara Jane and finding out more about her. Great review, I'm curious about an example of her 'Cold Fury'. This one caught my attention when I saw it in IMM's last week, and it's good to see it's got a 4 star rating.